Today, March 13th is Good Samaritan Day, also called Good Samaritan Involvement Day. It’ used to give thanks to all of the people who unselfishly help those in need. We can all be guilty of wanting to move quickly through our goals each day, when massive opportunities to pass on kindness actually present themselves in between. This day helps us pause to recognize the importance of looking around and noticing how we might be able to help someone out. It’s the compassion and kindness of strangers that really make a difference in the world. What is a Good Samaritan? The term ‘good Samaritan’ actually comes from a Bible parable. In the parable, a Samaritan helped a stranger who was robbed and beaten and then left to die on the side of the road. Two well-respected men, separately passed by the man. It was a Samaritan man, who stopped and helped the man up, even being busy in his travels. He cleaned his wounds, clothed him and paid for the man to stay and get well at an inn. Good Samaritan Day was created to honor Catherine “Kitty” Genovese. Kitty was murdered on March 13, 1964 in New York City just outside her home. Her killer tried to kill her not once, not twice, but three times. On the third time, her killer was successful. However, the previous two times, the killer was interrupted by witnesses, but NO witness ever called the police. To this day, we wonder if Kitty would still be alive if a good Samaritan had come to her rescue. Have you passed a person by? Have you ever witnessed a car accident and kept going due to a time crunch? Have you ever seen a parent trying to open a door while pushing a stroller and walked past them? Maybe you haven’t witnessed a crime of this magnitude, but you’ve likely experienced an incident where you could have helped but were “too busy” to stop. Every single person has done this in some way, so we are not here to guild you. We are here to help you build acts of kindness into your schedule. We’re all busy, but we promise, you won’t regret stopping to brighten a stranger’s day. We’ve put together some ideas to help you plan for and be prepared for a kind act. Create hygiene bags to give out to the homeless when you see them on the side of the street. You could put things such as toothpaste, a toothbrush, deodorant, mouth wash, floss, soap and baby wipes in the bag. Go grocery shopping for an elderly neighbor. Sometimes our grandparents and elderly neighbors have a hard time walking through the store. Take an hour out of your day to go get some essentials like bread, milk, eggs, fruits and veggies and meat for them. OR: if you’re in a huge time crunch, take advantage of Amazon’s new grocery delivery service. Stand up against bullying. When you see someone bullying another person in public, at school, or at work, say something. There is power in numbers. There is a way to do it so you don’t engage in petty arguments or get dragged into drama, but don’t let another person be bullied on your watch. Side note: If you’re experiencing peer pressure, and bullying right now call the free bullying hotline 1-844-256-0735. Tutor a student who is struggling. Finding volunteers to help people of all ages learn to read can be difficult in most states. Try googling ‘literacy’ and your city and state to see places you can volunteer. You can also check out our other blog here to find out how to inspire people to pick up a book. Become a mentor to someone by signing up to be a Big Brother or Sister. You can find out about some benefits for mentoring in our blog here. Many Big Brothers and Big Sisters also see growth in themselves for being a mentor to someone else. Help a neighbor take care of their yard. Sometimes we have a neighbor who is either disabled, elderly or a single parent who struggles to manage their yard work. If it is winter time and your neighbor could use their driveway shoveled, can you offer a helping hand? Or maybe you can rake the fall leaves. Brainstorm how you can help take care of a practical need. Drop off bus passes at a local school. Some students struggle getting to school every day because they can’t catch the free school bus or someone can’t drive them to school. If you drop off bus passes at a school office, the front office staff can offer it to students who are in need of public transportation help. Donate blood. Many local blood banks are operating at a shortage. Did you know that one single blood donation has the potential to help up to four people? Something you take for granted may be the answer to a stranger’s health concern. Be an Angel. Around the holidays, find a family in need. You can help put food on the table for the holiday and even help with gifts or basic necessities for their children. Volunteer at a homeless shelter. Shelters can always use extra hands whether it is handing out food or helping prepare food. It can be a very humbling experience to young adults and kids to be learn about generosity. Believe it or not, holidays are usually the most likely time for volunteers to sign up. So call your local shelter and find out when they are in need of an extra hand. You can also find out another 50 acts of kindness by checking out our other blog here. These 50 acts are even categorized by personality type to help you find an act of kindness that will best fit you. So go out there and be the reason why someone smiles today! Learn more about how you can be a standout amongst your peers in Ingredients of Outliers and Ingredients of Young Outliers. What are your plans to make someone’s day? Comment below and share with your friends. 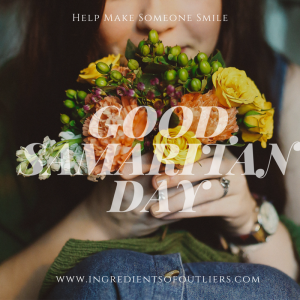 Happy Good Samaritan Day! Get a good education and share it with others. I really like the carry a hygiene bag. This act of kindness is really a big help. Thank you. I took a man in that we knew. He had an injury. The issue with being THIS KIND of a good samaritan, is that the person didn’t leave…and now after 16 months, it’s a bit old and I know now, he won’t leave unless we move away, or we get the nerve to tell him he needs to go find another place. This hurts my heart, as we are all in our 60’s and it’s easier to tell a young person to go. I feel guilty. Would Jesus want me to turn him out?